Beetroot improves exercise stamina and maintain our blood pressure in proper level. Beet contains great nutritional values that help defend against heart diseases, supports bile ducts, and gallbladder, birth complications and defects and several cancers, particularly colon cancer. Beetroot is mainly rich in calcium, iron and folic acid. Beets are loaded with folate. Beets are a great source of manganese and potassium. They are an excellent source of vitamin C, copper, phosphorus and magnesium. Beet contains dietary fibers. Beet has low glycaemic load, it means, when we consume beetroots, it is slowly converted into energy, it doesn’t overload our bloodstream with sugars, thus it maintains blood sugar level properly. Beetroot is rich sources of fiber (half soluble and half insoluble). The both fibers play outstanding role in fighting excessive fat in body. Weight gain is one of the common symptoms of a stressed liver, so healthy and good performance of liver facilitates weight loss by breaking down excessive body fats more efficiently. 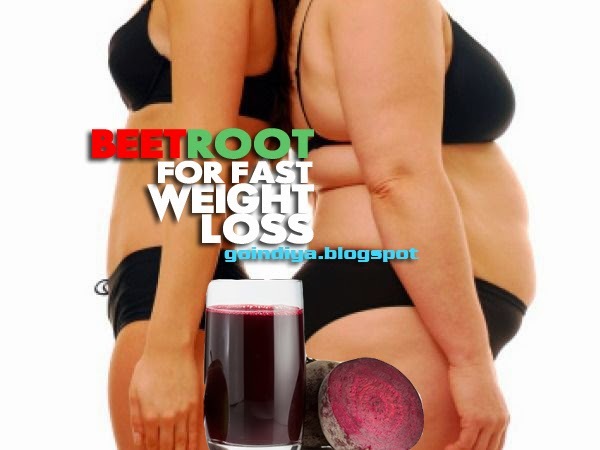 So beetroots are very beneficial dietary food for fast weight loss. Eating insoluble fiber can help to boost your metabolism and it can also help you to lose weight as the food that you consume helps to fill you up, but as you cannot digest it, you don’t take in as many calories from it. Consumption of food with a low calorie density makes feel full on fewer calories. Beetroot is very low in calories, containing approximately 38 calories per 100g of beetroot, and 0.1g of fat, it’s almost fat free. Half cup of cooked or boiled beets contains 38 calories, and this is considered an average calorie selection. Beetroots are also very beneficial for pregnancy weight loss plans. Beet is rich source of dietary fiber therefore it can help to fill us full and thus it helps to control our weight. Beetroot contains both types of fibers, half soluble and half insoluble fibers. Soluble fiber maintains balanced blood sugar level and reduces cholesterol. Beetroot also contains insoluble fiber, a fiber that our body system cannot digest, as our body cannot digest it, it has to be push out through our body as a waste material. Most of the vegetables have low glycaemic index (GI), but beetroot has a medium glycaemic index (GI). Red beetroot fiber decreases cholesterol by 30%, and reduces triacylglycerol 40%. Beets are an excellent and wise choice for your weight loss plan, as it reduces cholesterol with fibers. ½ cup of cooked or boiled beetroots contains 1.9 grams of fiber, which is recommended daily fiber intake. Add beetroot in your regular diet for fast weight loss and to improve your health. 1. Eat beet in any form raw, cooked, boiled, juice, baked, soups, pickled, salads or vegetables. 2. Prepare glass of beet juice from raw beets; add 1 tablespoon of honey and 1 tablespoon of fresh lemon juice. Drink this juice every day in the breakfast for fast weight loss. Also add 1 raw or boiled sliced beet in your salad and consume this in the evening. 3. Take 1 raw beet (medium size) and prepare juice of it, add 1 teaspoon of fresh ginger juice or paste to it and consume this mixture twice a day, in the morning and in the evening to lose weight. 5. Add cup of sliced beet, cup of sliced cucumber, cup of sliced carrots and mix them well. Sprinkle pinch of black salt and 1 tablespoon of honey on it. Consume this salad twice a day, when you are hungry. 6. Take 2 cup of slice beet (raw or boiled) and add 1 tablespoon of extra virgin olive oil, also add 1 tablespoon of fresh mint leaves paste or basil/tulsi paste to it. Eat this once or twice a day for fast result in weight loss. 7. Take 2 cup of sliced beet (raw or boiled), 1 cup of sliced raw tomato, mix them properly and add ½ teaspoon of black pepper on it and 1 tablespoon of fresh lemon juice. Consume this twice a day to reduce weight loss. 8. Drink glass of beet juice daily in the breakfast to lower blood pressure, it also maintains a healthy cardiovascular system. Lower your blood pressure within 1 hour by drinking beetroot juice. 9. Insoluble fiber encourages urine more often, which guarantees a healthy digestion and a healthy bowel, which decreases risk of bowel cancer.